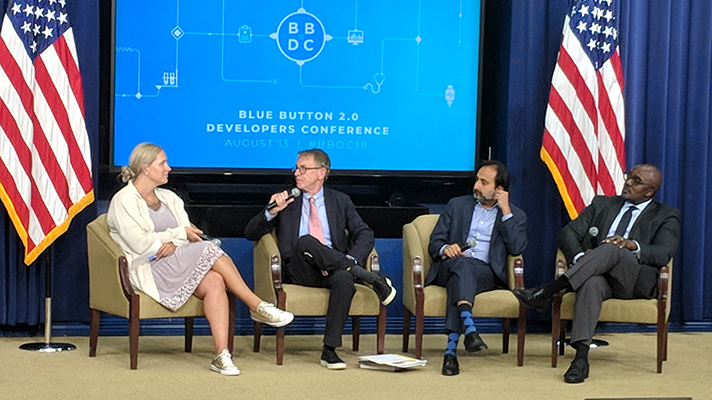 WASHINGTON, DC – During a panel discussion at the Blue Button 2.0 Developer Conference here at the White House on Monday, John Doerr laid down what he said were the five unique characteristics of extraordinary entrepreneurs. As chairman of the iconic Silicon Valley Kleiner Perkins Caufield Byers venture capitalist firm, Doerr should know. Also at the Blue Button 2.0 hackathon, Centers for Medicare & Medicaid Services Administrator Seema Verma said healthcare is "at the beginning of the digital health revolution," and called on insurance companies to make their claims data available via APIs. And Amazon, Google, IBM, Microsoft, Oracle and Salesforce held a previously unscheduled session to publicly pledge to removing interoperability barriers with cloud computing, FHIR and Argonaut specifications to give patients better access to their data and the ability to use it across different health systems.